Hazelnuts bring an unexpected dimension to this gorgeous soup. Their flavour, being delicate and sweet, works beautifully with robust kale and earthy celeriac. If you’re making your own stock, make sure it’s really tasty before you add it to the rest of the soup ingredients. That way you’re guaranteed the most amazing results. I like to slip in some toasted sourdough or other good country-style bread to the bowls before bringing to the table. Heat the olive oil in a large heavy-based pan over a medium heat. Add the celeriac, diced onion and thyme sprigs. Cook, stirring regularly, for 5–6 minutes, until the onion is soft but not coloured, then season the celeriac with salt and pepper. Scatter over the chopped nuts, the grated garlic, and the torn sage leaves and stir well. Cook for 1–2 minutes more, then add the stock and bring the contents of the pan up to a simmer. Cook gently for 8–10 minutes until the celeriac is tender, then add the chopped kale and return to a simmer. Cook for a further 10 minutes, until the kale is tender, then remove the soup from the heat. Add the chopped parsley to the pan, then season well with salt and pepper. 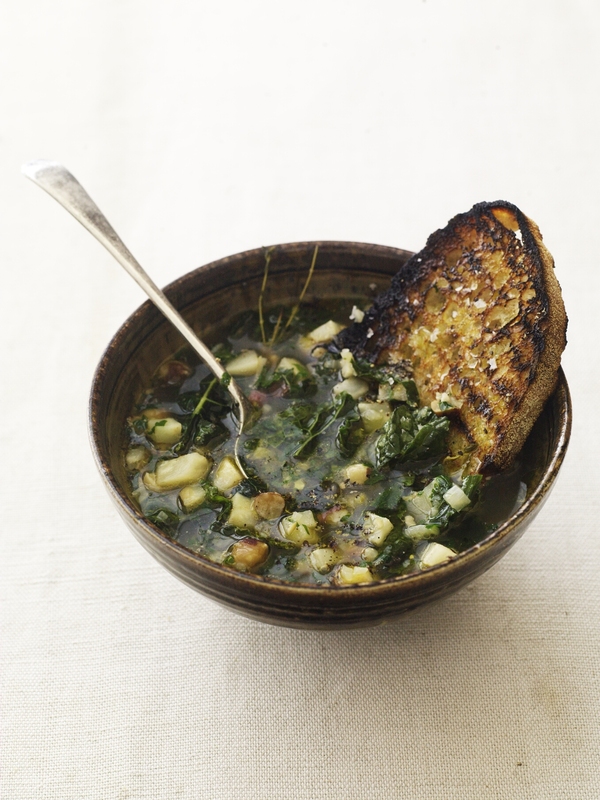 Ladle the soup into bowls and serve with some toasted or chargrilled bread rubbed with a halved garlic clove and sprinkled with flaky salt, then drizzled with your best olive oil.